Shapeoko Batch #2 is in the final stages of production. Here's a quick update on what we've been working on. One of the critical components that makes the Shapeoko CNC Milling kit possible is the MakerSlide rails invented by Bart Dring. These rails are an open source linear extrusion with a railing system built into it. The aluminum extrusions are pretty common in industry and are made by big machines like the one below. We took a tour of the factory where they make the MakerSlide for us. MakerSlide starts as a huge aluminum billet. 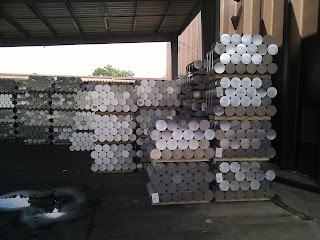 Here is what the stack of aluminum looks like waiting to be made into extrusions. The billets gets loaded on to a small conveyor and one piece is rolled into a track. The billet is heated up to 800-925F (426.6 - 496.1C) and then it is pushed into the loading area where a thin film of lubricant is added. Then a ram pushes it into the die. You can see the billet below about to be pushed into the machine.